Condition is Used. No known flaws. This radio is in excellent shape and working. These are very versatile radios. Radio with hand mic. Printed User Guide. 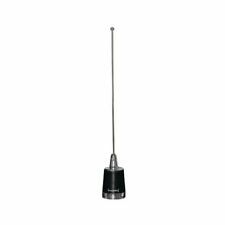 Black Omnidirectional NMO Antenna UHF 1/4 wave, 410-490 MHz pre-tuned. Model 1126B. Solid brass NMO mount with Black kote finish. Up to 200W power. 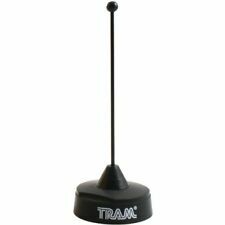 Black 3/4" Trunk Lip NMO Antenna Mount. 1 NMO 2.2" Magnetic base with MINI UHF plug. Mount Connector: NMO. UHF Antenna Cable to Radio's Connector: MINI UHF. Each frequency band has its own RF port. Gain: 2.5 dBi. USA STOCK, USPS FAST SHIPPING! 2-3 DAYS DELIVER! UHF 450-470 MHz. Each antenna includes Cutting Chart with instructions. UHF 380-520 MHz Pre-tuned. 380 MHz 1.75:1. 520 MHz 1.58:1. Stainless steel spring. Black Stainless steel tapered whip 0.1" (2.5 mm). No-ground plane. Frequency SWR. Unity gain without ground plane. Radios: UHF Portable. - 6 1/4” Stainless Steel Antenna. 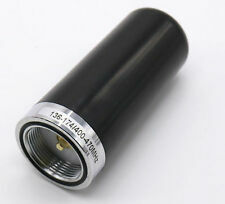 - Frequency Range: 410-490Mhz. Radios: Low Band Portable. XTL1500 XTL2500 XTL5000. Mini-UHF cable to radio connector,NMO mount to antenna connector, NMO antenna connector. (Unity gain. Requires assembly). Made by Motorola. P/n HAE4003A. Trending at $23.95eBay determines this price through a machine learned model of the product's sale prices within the last 90 days. 95% Braid aluminum foil. Double shield coax cable. 1 NMO Mount 2.2" Magnetic base with Mini UHF plug. Cable to radio's connector: Mini UHF. Mount connector: NMO. VHF 144-148 MHz 3 dBd. UHF 430-450 MHz 6 dBd gain. Antenna: Model #1180. 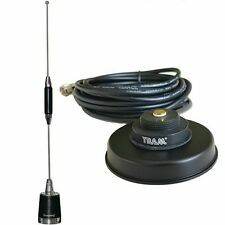 380-470 MHZ LOW-PROFILE MOTORCYCLE MOUNT UHF ANTENNA. Each frequency band has its own RF port. Frequency Range:380-470MHz. Maximum Power Input-watts: 50W. 3 dBd gain. Cutting Chart 455MHz 11 1/8 282. 450MHz 11 5/16 287. 3 dBd gain. 460MHz 10 13/16 275. 455MHz 11 1/16 281. 450MHz 11 5/16 287. Cutting Chart. Antenna: Model #1180. VHF 144-148 MHz 3 dBd. UHF 430-450 MHz 6 dBd gain. Antenna kit: UHF 1/4 wave Antenna Pre-tuned 450-470 MHz (tunable from 450-960 MHz, cutting chart enclosed) and Roof top 3/4" NMO hole antenna mount with assembled mini-UHF connector. Stainless steel taped whip. 1" (2.5mm). VHF 136-174 MHz 3 dBi. UHF 380-470 MHz 6 dBi. p/n BR322MUHF. Browning antenna BR-137. 2.15 dBi gain. 17 ft. RG-58U coax cable. Premium 95% bare copper braid, solid bare copper center conductor, with mini-UHF Motorola type assembled connector. 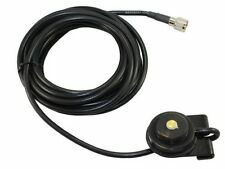 Roof top 3/4" NMO hole antenna mount with 17 ft low loss RG-58A/U Coax Cable and mini-UHF connector attached.